A Merlin helicopter has landed on HMS Queen Elizabeth's enormous flight deck - the first aircraft to ever touch down on Britain's biggest warship. 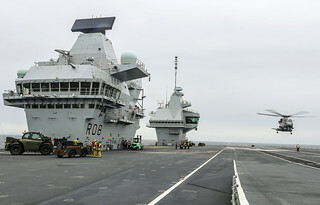 It fell to 26-year-old pilot Lieutenant Luke Wraith from Yorkshire to set the 14-tonne helicopter safely down on the aircraft carrier, just days after she left Rosyth to begin trials in the North Sea. He had a four-acre flight deck - almost the size of three football pitches - to aim for, where experienced aircraft handlers were waiting to guide him safely in and then lash the helicopter firmly down.